You got a new mission on your team and the only way you could accomplish it is to go in there to prove everyone how good you can be when it comes to drive a tank on the ground and also you have to guide it when it's in the air. 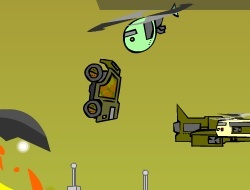 This car game revolutionate the whole idea of gaining combos because you'll have to assimilate bombs to boost your car in the air so in this way you could crush the planes and the other obstacles to gain your bonuses. Choose the game mode you like the most and let the explosions begin. You can control the tank while is in the air, actually you need a perfect timing and coordination to do that and you have to either improve your skills or add new ones. Prepare your position and when the bombs come be ready to jump over to smash them all. Try some tricks and make your own method of collecting points. Have fun and don't forget this time you don't have to drive safe, go insane. Use the arrow keys left/ right to move. Indestruc2 Tank 0.00 between 0 and 10 based on 0 votes.